91 Foot Yacht Explosion and Fire | Fire / Reconstruction Consultants, Inc.
Summary report of Yacht Explosion and Fire. 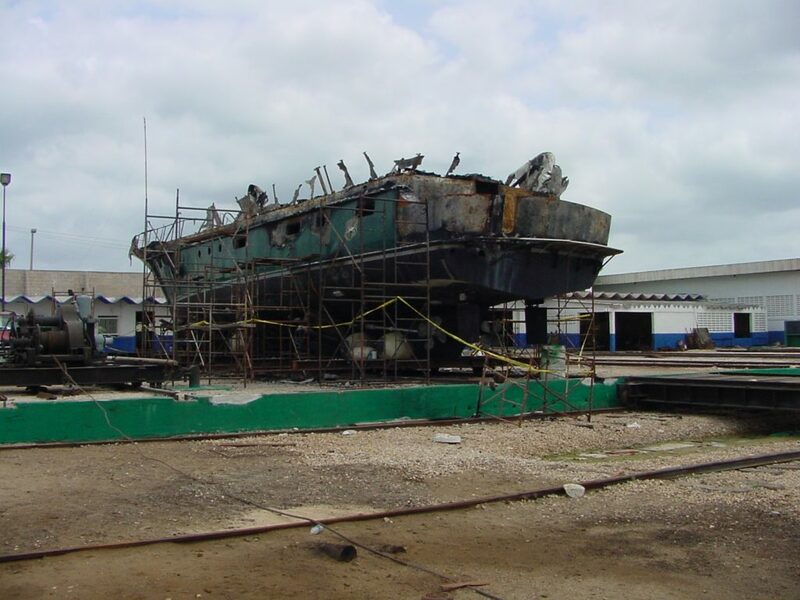 Fire Reconstruction Consultants was hired to conduct an investigation to determine the origin and cause of the explosion and fire that damaged the 91 foot vessel. The following is a summary report of the data gathered during the on scene investigation and analyzed in order to determine the origin and cause of this incident in accordance with the basic standards set forth in NFPA 921, 2001 edition. Advanced techniques and standards that go beyond the basic criteria set forth in NFPA 921 and the various ASTM standards for chemical testing, evidence documentation & handling and explosion & fire dynamics may have been used in the analysis of the data gathered. 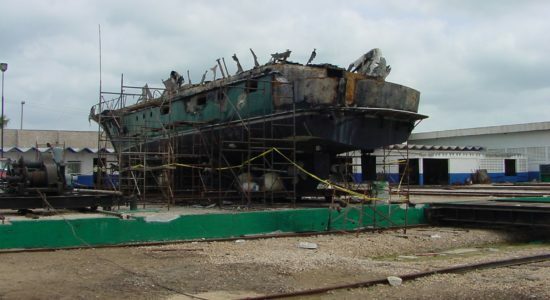 Fire patterns were observed emanating from two (2) separate unconnected sections of the vessel with communication of the fire to liquid combustibles, wooden decks, cabin furnishings, wiring insulation, bedding materials, interior headliners, aluminum superstructure, etc. One of the areas of origin was the port side of the laundry room and the other was in the aft stateroom at the stern of the vessel. Patterns in other areas indicated the probability of additional areas of origin, however, all of the combustible materials had been consumed and additional samples could not be secured. Samples were taken from the vessel for evidence and chemical testing purposes. Analysis of the explosion and fire patterns, laboratory testing results combined with observations of the several systems and various areas of the vessel and other information uncovered and analyzed had revealed evidence of highly volatile ignitable liquid materials having been placed throughout the vessel and ignited. Numerous metal cans were found throughout the vessel with holes punched into the tops, sides or bottoms. Many were found without tops in place and no evidence to suggest that the tops had been forcibly removed during the explosion and fire sequences. Other cans did show the effects of flame impingement. Clean window glass and teak blinds with no evidence of soot or other unburned combustion by-products were found scattered in a wide arc up to 228 feet from the vessel. The heavy teak steps from the aft cabin to the aft cockpit were found in an unburned but shattered condition between 48 to 69 feet from the stern of the vessel. The result of explosion pattern analysis indicated that the epicenter of the explosion was located in the approximate center of the main salon/stateroom areas of the vessel. A vessel employee was on board the vessel at the time of the explosion and fire. He had left work at approximately 20:30 the evening before the incident and there had been no explanation as to why he was back on board the vessel at approximately 01:30 when the explosion and fire occurred. Evidence that he had a burned thorax suggests that he was inside the vessel and breathing the explosive atmosphere just prior to or when the explosion and fire initiation occurred. He also sustained a fractured left foot, left leg and left thorasic vertebra which may have indicated that he was standing with his left foot on the steps from the aft cabin to the cockpit when the explosion occurred. He also sustained burns on his lower legs, thorax and face. He has since died and it is believed that no statement was secured from him before his death. 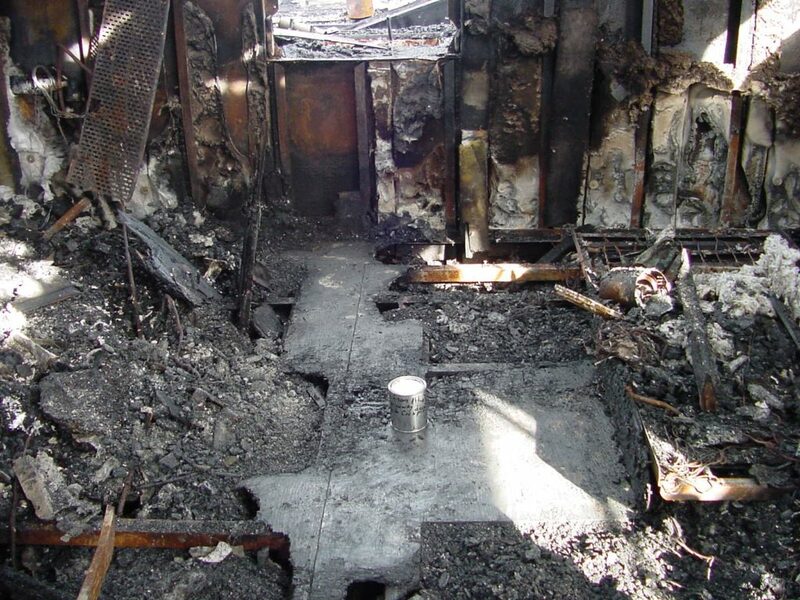 Distinct burn patterns were visible on the port side of the vessel in the area of the laundry and refrigeration room, below the formal dining salon and on the deck in the after stateroom area. The vertex of the Vee shaped pattern on the exterior port side of the vessel indicated a truncated cone fire pattern that corresponded to a puddle burn type pattern found on the top of the laundry room counter outboard of the washer and dryer. Sample #1 was taken from this puddle burn pattern. The other visible pattern was a trailer type puddle burn pattern running from the port bunk in the after stateroom across the wood deck and through a hatch down into the bilge in the center of the aft stateroom. Sample #3 was taken from this pattern. Other areas also appeared to have fairly distinct patterns, however, all of the combustible materials had burned away in those areas precluding additional samples being taken. The result of chemical testing, in accordance with the basic ASTM standard E-1618-97, Standard guide for identification of ignitable liquid residues in extracts from fire debris samples by Gas Chromatography-Mass Spectrometry and other more advanced standards had revealed the presence of added ignitable liquids in both test samples 1 & 3. Both samples are similar to control sample #2. 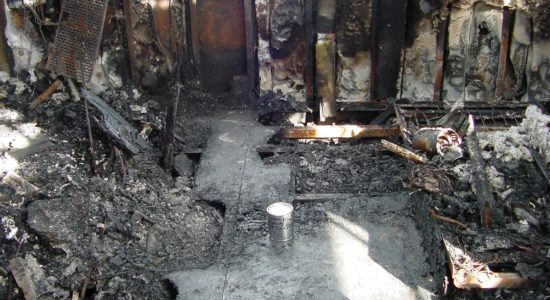 Common fire causes such as discarded smoking materials, electrical faults and failures and spontaneous ignition had been eliminated in the areas of fire origin. It was the opinion of this organization that the cause of the explosion and fire was, in all probability, incendiary in nature. The result of person or persons, having placed ignitable liquids in various areas of the vessel and causing them to become ignited.